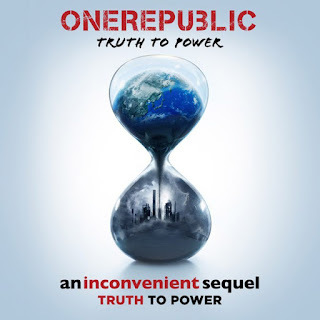 Multi-platinum, Grammy-nominated quintet OneRepublic release "Truth To Power" on June 30, on Mosley Music/Interscope Records. "Truth To Power" was written and produced by Ryan Tedder and T Bone Burnett and will be featured in the Paramount Pictures and Participant Media's Film "An Inconvenient Sequel: Truth To Power," which will be in theaters July 28. "Truth To Power" is available for streaming and digital download via all participating digital retailers – smarturl.it/TruthToPower. "Ten years later we are still talking about climate change," OneRepublic lead singer/songwriter Ryan Tedder said. "Former Vice President Al Gore has again made a film that inspires one to get involved and do something for our planet. It was an honor to create a song with the legendary T Bone Burnett that speaks to the theme of this movie that the 'truth' leads to 'power' when it comes to standing up and helping to create change." "Music can often move us in ways that words alone cannot," former Vice President Al Gore, said. "Ryan Tedder and T Bone Burnett have written and produced a beautiful and powerfully inspiring song for 'An Inconvenient Sequel: Truth to Power' about how the truth about manmade climate change is itself turning into the power humanity needs to solve the crisis our world is facing -- with courage, conviction, and faith in one another. I am so grateful that these two great artists were able to capture what Mahatma Ghandi called 'truth-force' in their incredible and moving song, 'Truth to Power.' It's an instant classic and, for me, has been an earworm since I first heard Ryan sing it." "Genesis 2:15 says that 'The Lord God took the man and put him in the Garden of Eden to work it and take care of it,'" T Bone Burnett said. "As a Christian, I have to say that our withdrawal from the Paris Accord is tantamount to taking an ax to the Tree of Life and an outright rejection of God's Word. If you care for our beautiful blue planet, this film makes obvious the actual, catastrophic effects of climate change. I pray this film will open the eyes of my brothers and sisters who have been deceived into believing that the reality of rising temperatures, mega storms, droughts, glaciers melting, and water rushing into the streets of our cities is a hoax. This is wickedness in high places and evidence of a death wish." Paramount Pictures and Participant Media present an Actual Films Production of "An Inconvenient Sequel: Truth To Power." OneRepublic will be opening for U2 on select dates of The Joshua Tree tour, followed by their North American summer run headlining the 2017 Honda Civic Tour with Fitz & the Tantrums and James Arthur opening.